Kim Malz 5:00, Dave Castro 8:00 (GHD). We often talk about scaling down, but what about scaling up? Watch a demo of today’s WOD with GHD sit-ups wmv/ mov. Check out the Clash WOD for the competition this weekend here. We will be meeting at the gym at 6am on Saturday morning, and leaving around 6:15 to get there for the athlete check-in time at 7-7:30am. 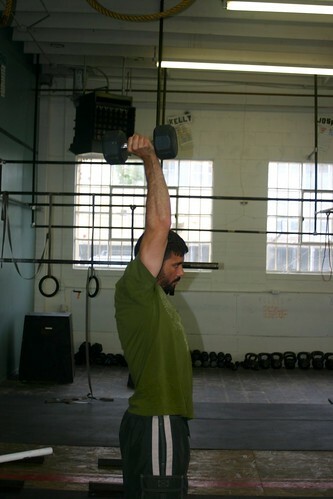 Feel free to plan a later meeting time if you want to get there for the first WOD at 8am. There will still be regular classes if you cannot make it to Ventura! Not all bodies are created equal. Above, Sean is activating and locking out to the best of his abilities. Ideally, the wrist and elbow would line up over the shoulder with the spine in a neutral position. Watch an instructor explain and fix an athlete’s position here wmv/ mov. Its not always that simple though! Many of you will need to actively pursue a greater range of motion through mobility drills. Watch the infamous Kelly Starrett explain some two minute drills, as he calls them. The idea is that this does not have to take a lot of time, but if you get to class just four minutes early, you can affect a lot of change on your body. Watch two example here: The Keg Drill wmv/ mov and Distracting the Joint wmv/ mov.